The handy little Dash Button was an interesting idea by Amazon. You know, the physical little button which could be linked to a specific product that allowed users to place an order of that product with a single push? Great idea, but not really practical for those that may want to have a number of them in the home for products which are consumed quickly and need to be replaced regularly. Well, to try and combat that, Amazon has just launched the digital version of the Dash Button, which means consumers can achieve the same thing from Amazon’s website or mobile app. Consumers who regularly shop on Amazon have spoken positively about the concept and idea behind the Dash Button. Being able to have one or two in the home to order products that are regularly depleted with just one tap, such as soaps/detergents or diapers for babies, is undeniably an appealing prospect, and one that has become popular in certain homes. However, given that there are literally millions of products eligible for Dash Button ordering it just isn’t possible for homeowners to litter their properties with these physical buttons. That’s really where the virtual Dash Button solution fits in for Prime members. Amazon is automatically starting to use the purchase history of Prime members to create and show a selection of virtual Dash Buttons on the Amazon homepage and within the Amazon mobile apps. 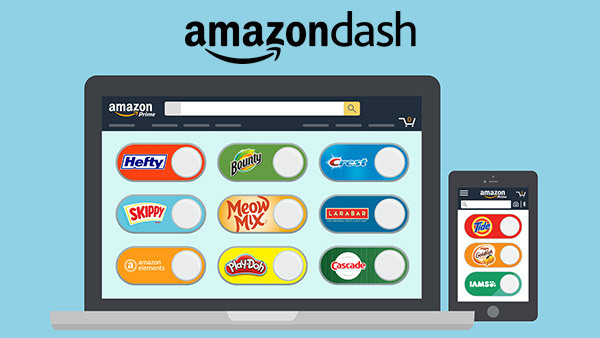 Like the physical Dash Button, a single click on the virtual solution will instantly place an order of whatever product is assigned to that Dash widget. The company is also extending the proposition by introducing a new “Add to your Dash Buttons” option assigned against eligible products under the “Add to Cart” button. A great little feature considering each physical Dash Button costs $4.99 to own, whereas the virtual solution is easy to create, instantaneous with no delivery of the actual button, and totally free to set up. Just exactly how popular these buttons will prove to be is an unknown at the moment. Only Amazon truly knows how many of its physical buttons are out in the wild and regularly used to order products with little or no fuss. Personally speaking, I enjoy visiting a physical grocery store to order items that I would consider as consumables, such as face wash and toothpaste, and use Amazon for larger purchases. However, there’s obviously enough analytical data to convince Amazon to expand on this new experience.